On the outskirts of Tarifa, close to the village of Bolonia on the Costa de la Luz, lies a fascinating Roman city dating back to the 2nd century BC called Baelo Claudia. The ancient Roman town is located 22 kilometers (14 miles) outside of the city of Tarifa, right on the dunes of the village of Bolonia. On the shores of the Straits of Gibraltar, the town was originally a fishing village and also a North African trade link, settled around 2,000 years ago. At the time of Emperor Claudius the town was thought to be very prosperous, as it was a major port for Tangier in Mauretania Tingitana (now Morocco) and also supplied salted tuna fish, garum and other products to various other Roman cities close by. 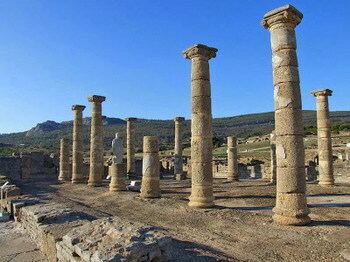 Baelo Claudia: 2nd century Roman city near Tarifa in southern Spain from Anne Sewell on Vimeo. On arrival, guests enter through the museum building, where there are impressive displays of various Roman artifacts and also information about the ruins themselves. You can then do a walking tour of the major attractions in the Roman city. The first thing you will come across one of three aqueducts in the city, used to bring water into the town. Next visit is to the Forum Square, pretty much like town squares today. As you walk along the pathways, you come across the residential areas, Roman baths, shopping areas and pretty well preserved Roman roadways, which make you wonder if our roads could stand up so well after 2,000 years! Near the beach can be found the fish salting factory, with its many bins. This area was also used for the production of garum, a fermented fish sauce used as a condiment in the cuisines of ancient Greece, Rome, and Byzantium. 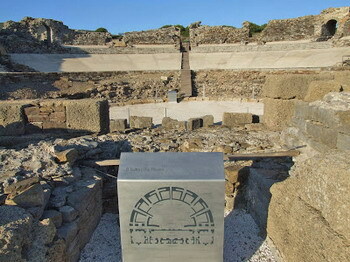 Next stop is the Roman amphitheater, the heart of the city's entertainment area, which has been partially restored. Each god has its own individual temple, instead of one temple dedicated to them collectively, although they shared an altar; the only other Roman town believed to have a similar arrangement is Sbeitla in Tunisia. Either at the beginning or end of your tour, the museum is a very worthy browse, as it has many well preserved artifacts on view and plenty of information about the site. 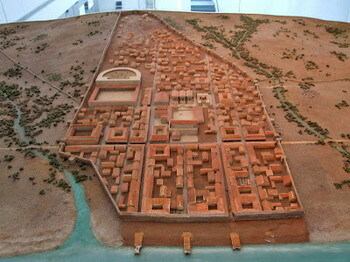 You can see a mock-up of how the city would probably have looked 2,000 years ago and also details of the original archaeologists that worked on the site. More photos are included in the video above, and more information on the area can be found here.